After the widely successful release of „Summer in Jakarta“, Jakarta Records figured it’s time to gather some artist we like, work and/or are friends with again for the second installment of the loose series. „Winter In Jakarta“ features all unreleased material by artists such as Stwo, IAMNOBODI, Mura Masa, Oddisee, Guts, L’Orange, Suff Daddy and many more. The album will be available as a free DLL on the 9th of February. Keep your eyes open for the free cassette tape edition available from selected retailers. Croatia’s iconic celebration of bass music culture Outlook returns for its 8th year this summer from September 2nd – 6th. Taking place at the stunning Fort Punta Christo on the Adriatic coastline near Pula, Outlook has become synonymous with spearheading the region’s thriving festival scene, uniting music lovers from across the world for an unrivalled adventure under the sizzling sun and stars. The first round of artists for Outlook will be revealed at the end of January. 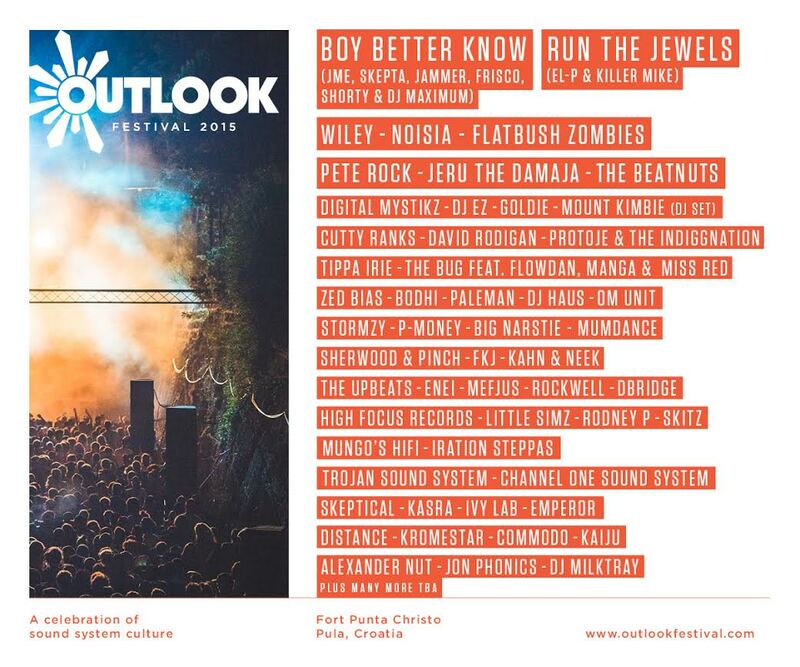 Outlook is one of the world’s most pioneering festivals and a leader in bass music and sound system culture. Returning for its 8th season in the majestic Fort Punta Christo and a 2000-year old Amphitheatre for the opening concert, it unites the very best artists across dub, reggae, hip-hop, drum ‘n’ bass, garage, dubstep, house, techno and electronica on the dazzling Adriatic coast. It carefully curates the most dynamic, respected and forward-thinking lineup to create a who’s who of talent, sound-tracking hazy days and pulsating nights a world away from normality. Because Outlook is not just a festival, but a mind-blowing experience bringing people from all over the world together along a thrilling, intense and mesmerising journey like nothing else. And now the first names for September 2015 can be revealed. All informations about Tickets & Camping. Run The Jewels’ live show is pure intoxicating energy as they headline Outlook fresh from a world tour and topping everyone’s 2014 best album charts. Hip-hop legends El-P (of Company Flow & Def Jux) and Killer Mike join forces for a crowd-rousing performance which will have Outlook absolutely rocking. They are joined by the Flatbush Zombies; these guys are one of the hottest new hip-hop acts around, championed by Joey Bada$$ and Pro Era. The Brooklyn-based Flatbush – aka Meechy Darko, Zombie Juice and Erick “Arc” Elliott – bring a freaked-out alternative hip-hop style to Croatia. Outlook continues to embrace grime and garage as integral foundations, and 2015 again brings some huge names to the party. Boy Better Know – aka JME and his brother Skepta, alongside Jammer, Frisco, Shorty & DJ Maximum – bring their dazzling action to Pula, whilst BBK founder Wiley also performs a solo live set too; the former Red Bull Culture Clash champions are right at the top of their game. And following on from last year’s awesome Harbour Stage set by DJ Premier, the only person deemed worthy to take on the gauntlet this year is Pete Rock, who is widely recognized as one of the greatest hip-hop producers and DJs of all time. Joining him are some of New York’s finest rappers and producers woven into the fabric of hip-hop’s rich history and legacy, Jeru The Damaja and The Beatnuts. Digital Mystikz’s Mala and Coki return with their heavy dubstep; festival favourite DJ EZ is back this summer to absolutely smash it after many Outlookers in 2014 said they wanted him back; and representing the new breed in a bubbling scene is Mumdance and Gilles Peterson’s breakthrough artist of 2014, Little Simz. On the drum and bass tip, the first names revealed are extra special, representing both ends of the spectrum from its brightest stars to its true legends. First up, Dutch electronic trio Noisia bring their celebrated sounds to the festival; Goldie is one of the scene’s champions and he remains an acclaimed icon; fellow long-term player and Exit Records founder dBridge remains right at the fore of everything great; Om Unit’s revered Threads album showed why he is one of the brightest producers around; and Mefjus and Enei both star too, with many more drum and bass names to come. An extra special guest of honour is Cutty Ranks; legend doesn’t even come close to this dancehall and Reggae vocalist of immense repute. And Outlook would not be the same without the luminary David Rodigan, who returns to present a main stage takeover with his speaker-shaking Ram Jam. He is joined by “BBC Sound of 2015” artist Protoje & The Indiggnation, one of Reggae’s new leading lights, whilst festival regulars Mungo’s hifi and Iration Steppas both return to lay it down extra heavy. The legendary team of selectors and vocalists from the Trojan Sound System take over Outlook again, and the immense Channel One Sound System gang return too. Expanding its musical range even further, Outlook is proud to announce some stellar talent from across the electronic spectrum. Mount Kimbie touch down for a special DJ set; with two critically acclaimed albums behind them, their genre-crossing sound is truly unique. The Bug ft. Flowdan, Manga & Miss Red experimentally fuse grindcore, industrial, metal, hip-hop, dub and jazz to sublime effect, and FKJ Live has been causing a big stir recently, the Roche Musique alumni a true eclectic taste-maker. Eglo Records’ Alexander Nut returns to Outlook, festival icon Zed Bias brings heavyweight garage, house and broken beats, with Jon Phonics and DJ Milktray fresh from their recent Astral Black Boiler Room takeover. Further names announced in the first wave of artists include Tippa Irie, Sherwood and Pinch, Bodhi, Paleman, DJ Haus, Khan & Neek, The Upbeats, Rockwell, High Focus Records, Rodney P, Skitz, Skeptical, Kasra, Ivy Lab, Emperor, Distance, Kromestar, Commodo and Kaiju, with many more to be announced. The sublime Fort Punta Christo setting is unlike anything else, with myriad spaces including a moat, dungeon, garden, boats, beach and more, and two live stages in the harbour and forest. From the incredible setting perched above the dazzling Adriatic Sea, to its ground-shaking rigs from Mungo’s HiFi scoop rig to Void’s Incubus system, Martin Audio’s Longbow and the legendary NCA Soundsystem, it’s a thrilling adventure under the sun and stars. The festival site is easily accessible from the nearby beautiful city of Pula, and a little further away Trieste. As well as the festival’s campsite, there are many hotels, apartments and rooms for private hire nearby. There is plentiful onsite food and drink, and many bars and restaurants in the surrounding area. Lenart Krečič bo danes zvečer skupaj z Big Bandom RTV Slovenija nastopal v Cankarjevem domu v okviru Cankarjevih torkov. Lenart Krečič, saksofonist, aranžer in skladatelj, je razpet med New Yorkom in Slovenijo. V Združenih državah je končal magisterij in sodeloval s številnimi velikani jazza. Kot skladatelj se loteva različnih projektov, vse od komornih zasedb do velikih jazzovskih orkestrov. Svoje vrline, tako kompozicijske kot izvajalske, bo v Klubu Cankarjevega doma pokazal z Big Bandom RTV Slovenija. Tega bo tudi vodil. Program bo samo avtorski, nekatere skladbe bodo napisane prav za to priložnost. V goste je povabil izvrstnega bobnarja Gena Laka in basista Borisa Kozlova, na koncertu pa lahko pričakujemo še kakšno presenečenje. Lenart Krečič je ta teden gost v TOP5ki in to je njegov izbor.